The Ocean Heights Apartment in Ocean Beach, Vice City, GTA Vice City. Ocean Heights Apartment is an apartment in southern Ocean Beach, Vice City, prominently featured in Grand Theft Auto: Vice City as one of the player's safehouses. Available for purchase immediately after "In the beginning...", Ocean Heights Apartment is a sleek red-and-white apartment tower visible around much of Ocean Beach, and is situated just southwest from the Pole Position Club, opposite the Maison Wenifall hotel and a block east from the Ocean Beach Fountain and the Ocean Beach Ammu-Nation store. A seaside building with a helipad, which is retconned in Grand Theft Auto: Vice City Stories as being a place of residence for Lance Vance, is also a short walk to the southwest. The safehouse is moderately costly, costing $7,000 to purchase as the safehouse comes with a garage for one vehicle. However, the garage also comes with an added perk, featuring a high clearance, which, unlike other safehouses with garages in Vice City Beach, is capable of allowing a Mule, Spand Express or Benson to enter. Upon purchase, the apartment becomes a save point for the player to save games. Like most other safehouses, the Ocean Heights Apartment has no interior. The apartment building exists unchanged in GTA Vice City Stories, two years before events in GTA Vice City, but is not interactive. 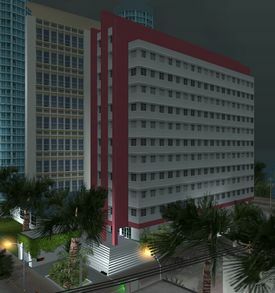 The Ocean Heights Apartment is one of the three tallest safehouses in GTA Vice City, along with the Hyman Condo and 1102 Washington Street. This page was last modified on 25 December 2012, at 22:46.